The iPhone can store just about any piece of information your heart desires—contacts, photos, and Web pages. But getting that information off your iPhone can take some doing. 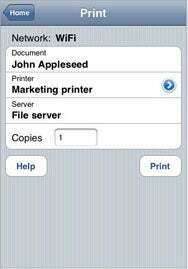 EuroSmartz aims to tackle the task of printing out that information with its appropriately-named app Print . The $3 app for any iPhone or iPod touch running the iPhone 2.1 software update lets you print via Wi-Fi or cellular networks. EuroSmartz says its Print application lets users print any Web page, contact, or photo from a mobile device, including the ability to print remotely back to an office or home printer. Note that Print requires you to download a free desktop application that runs on OS X 10.4 or later (as well as Windows XP or Vista, though the developer warns that some Windows configuration may be required). HolyWars , from Vito Technology: The free social networking tool features online polling, letting users post their points of view while seeing the results of surveys in real time. In Season , from Light Year Software: The $2 app shows when fresh fruit and vegetables are in season, how to pick fruit and vegetables at the market, and how to store them once you’re at home. Poker Money , from Vigree: The $5 app tracks poker performance and manages your bankroll. goodNite , from Agemarks Technologies: The $1 utility turns an iPhone or iPod touch into a digital clock, sound-controlled night light, and alarm clock. Wanted , from Portegno Apps: The $1 app lets you create Old West-style Wanted posted from pictures taken by or stored on an iPhone or iPod touch. ForeFlight Mobile , from ForeFlight: Version 2.1 of the $75 flight-planning app adds the ability for pilots to download and store a global airport database on the iPhone or iPod touch. ReaddleDocs , from Readdle: Version 1.2 of the document and file-management software, priced at $10 for the holidays, lets users save files to the iPhone and iPod touch from almost any source, including Windows, Mac, or Linux computers; Web sites; e-mail attachments, WebDAV-enabled online storage sites; and other iPhones.